Having a stroke of genius isn’t an everyday occurrence, but when you’re a hardworking recruiter, hiring manager, or HR expert, creativity isn’t something you can wait on. Whether it be the next great job listing or answering to the newest employment challenge, everything one does has to be inventive, interesting, and effective. This means that like any other artist or expert in their craft, you hit walls that lead to blockages in productivity. Most of the time, we settle for less than perfect in order to get something out and on time — but that doesn’t result in our best work. Every body is different, which means that everyone has a variance in the times that their energy dips. You might feel more awake when first arriving in the office, but drowsy after lunch. Alternatively, your coworker may be drowsy in the morning and awake in the afternoon. Whatever your “chronotype” is, being aware of your own habits could be the difference between knowing the best time to get more done and floundering through the day. Being creative usually takes a clearer mind that embracing rules while searching for new ways to follow them. Because of this, we are actually better at brainstorming and creative projects when our brains are not working at full capacity. When we’re sleepy, our brains tend to wander, producing random thoughts that lead to more “out-of-the-box” thinking. So, when you know a project will take a little originality, save it for that time of the day when your energy wanes. Obviously, the environment in which we work affects us, and, unfortunately, we aren’t always able to make big changes. Studies have popped up all over about the colors that make us more productive, but, as with anything, there is a lot of opinion on what is best for each personality, job description, and location. Research shows that blue affects the mind, yellow affects emotions, red affects the body, and green affects balance. Combining those colors can stimulate all of these focuses as well. Of course, this doesn’t mean you should go on a painting spree – especially since the color of the office might be out of your control anyway. Instead, focus on smaller, more adaptable things. Find picture frames, pencil cups, images, and/or desktop backgrounds that stimulate you. If you can, be mobile. Find new places and levels to work from. My CEO says that creating different levels and considering the type of light in the office is the best way to fuel her own creativity. Additionally, one study found that a group of hikers experienced a 50 percent increase in creative problem-solving after spending an extended time in nature, so finding some time for fresh air could be all you need for a boost. Generally, when we think of creativity, we think of a talent someone is born with. While there are some who just have the naturally artistic eye, this doesn’t mean everyone cannot develop a flair for innovation within their own fields. After all, there are painters who would never know how to conduct those amazingly insightful interviews you’ve lead! In other words, remember you are an expert in your field and can learn and grow. Some simple ways to boost your creativity in the office are doodling on a scrap paper, listening to a TED Talk, or putting on some music. Adding a hobby or practicing meditation or yoga are great long-term goals to make habitual. Anything that lowers your stress will help ease your mind and make idea creation easier. Of course, creativity isn’t something tangible, and London is simplifying the problem of overcoming creative drought. That said, he is right about one thing: you have control over the progress of your creative genius. 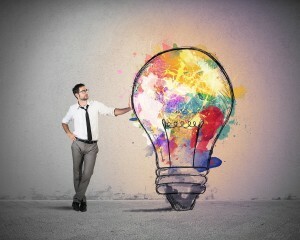 While being an innovator may come naturally to some, it isn’t impossible to practice. Take ownership, because you can spark your own creativity! What do you do to boost creativity? Tell us in the comments!